-Make a project featuring "Paper Piercing". -Or Make a project using the colors "Blushing Bride, Riding Hood Red & Early Espresso". -Or "Mash it Up" and create a project using the colors "Blushing Bride, Riding Hood Red & Early Espresso with some Paper Piercing" . I'm not into Valentines Day, so I try and steer away from making cards specifically for that day.I decided to continue my winter theme and changed it up a bit by stamping my snowflakes in Blushing Bride. During the winter in Alaska we get beautiful alpenglow and the mountaintops glow with gorgeous red and pink colors so as I was stamping my snowflakes that's the image I had in my mind. 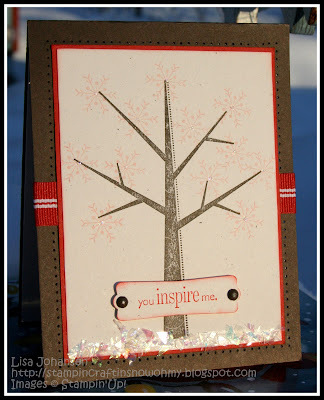 I like the sentiment " you inspire me" because it can mean so many things, and the card could therefore go to just about anybody important in my life! I love paper piercing but am horrible with straight lines. I was doing good on this card until my cat decided to jump up on my desk and bump my arm, therefore making part of my piercing crooked. Oh well, just adds some character to the card right? My kitty Calliope didn't seem to mind, LOL. Its hard to see in the picture but I added some Dazzling Details to the middle of the snowflakes and since I have lots of snow at my place, I added mica flakes as snow under the tree! Make sure you head over to the Friday Mashup blog to check out the great inspiration from the rest of the design team and then play along with us! LOL Gotta love those little helpers who add that special touch to a card for you. :) I haven't had my coffee yet, so those lines look perfectly straight to me. :) Love the colors with a winter-look! Pretty card! I love the feel of Alpen Glow you created Lisa! Fabulous card. I love all your little pink snowflakes with the added pizzazz of glitter! Oh wow! I just realised, you used both pink AND glitter in your card. I hope you had a good lie down after that one! LOL. Seriously it's not too girly. Wonderful card! Love the pink snowflakes and the clean look! Love this!! I really like how you added the snow at the bottom. This lovely scene makes good use f these colors. Love the piercing around the design.